A raven arrived. It turns out Ned Stark's years and years of promises are being fulfilled. Winter is here. Or, Winter Is Here is here. That's the name of the next beer in Ommegang Brewery's Game of Thrones line of beers. Winter Is Here is a Belgian-style double white ale. Fittingly for a double white (walker) ale, the label is graced by the ominous visage of the Night King, who is expected to arrive as forcefully in Season 7 as this beer's 8.3% ABV will arrive in your stomach. Unfortunately, new Game of Thrones and new Game of Thrones beer won't arrive simultaneously. The show returns July 16, but the beer won't hit shelves until October. When the beer does hit shelves, it will do so alongside a re-release of the Fire And Blood Red Ale, the third beer in the series released back in 2014. 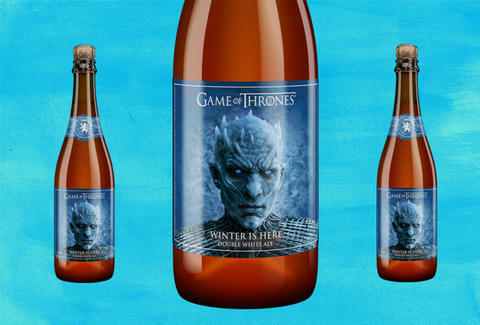 Both beers will be available in the single giant 750-milliliter bottles and in a collector's pack featuring both beers and a Game of Thrones glass. Meanwhile, thirsty Thronies can still put their gauntlets around the Bend the Knee golden ale, the most recent beer released in the Game of Thrones line. Huzzah!